Snail and Prince Aspen are unlikely companions. Snail is a midwife's apprentice; Aspen is a prince held hostage to prevent a war. Due to a series of misunderstandings, the two find themselves on the run, having adventure after mishap after scary, fast-paced escape. When they reach Aspen's kingdom, they learn to their horror that their actions have divided the country and plunged it into violence. Every minute counts: it is time for Snail and Aspen to figure out a way to stop the building war—together. 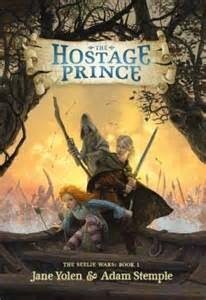 The Hostage Prince is a fast-paced, funny, exciting fantasy novel for young readers, both male and female. And who better to start tweens on their journey than Jane Yolen (“America's Hans Christian Andersen”—Time) and her son, Adam Stemple! I found this book almost on accident after browsing through a bookstore, I was on my way out and this gem caught my eye. The Hostage Prince has a little of everything I love, underdogs, royalty, the fey, and most of all the set up for a really great story. The Hostage Prince focuses on Snail, a midwife's apprentice in the Unseelie castle and her companion Prince Aspen a Seelie prince held hostage to prevent the two sides from going to war. The story opens up with the castle getting ready for the Unseelie Queen to have a baby. After a series of unfortunate events Snail and Aspen find themselves thrown together in an attempt to escape the castle, and accidentally starting a war in the process. Snail is a delightful heroine with her sarcastic wit and take charge attitude. I liked her from the start, and she only grew on me through the book. Aspen is a prince unused to friends or being pushed around by those of lower status than him, but he still tries to be polite and proper. Snail is good for him, and I think by the end of this series he will make a wonderful hero in his own way. The other characters aren't as formed as the main one's but they still each have a personality of their own and I can't wait to see more of them in future books. The story started a little slow, and I was expecting certain things to happen faster than they did, but after it got going The Hostage Prince was a fast paced adventure that kept me turning pages to see how Aspen and Snail would get out of each bit of trouble they found themselves in. I found myself wondering how the Unseelie Queen's baby was going to play into things, and what special role the Stickman would play in the rest of the series. The authors did a great job of portraying the Unseelie and Seelie worlds for children to understand and their world building was excellent. Jane Yolen and her son Adam Stemple have crafted a very well written first book in what hopes to be a great series and I can't wait to read the rest. This will be a great read for anyone who is a fan of fairy books, fantasy, and is great for young and old.